According to legends in the town, the yawn of a Slowpoke causes rain. 400 years ago, a drought in Azalea Town ended right when a Slowpoke yawned. This caused Slowpoke to be highly revered by the townspeople. Full Heal One in the well, one on the well wall. 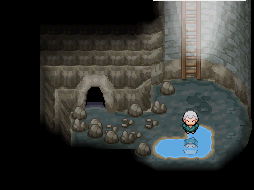 Before entering the well, you must visit Kurt, who'll explain that Team Rocket is trying to gather Slowpoke tails to sell for large amounts of money. He'll then storm off to do something about it in a fit of rage. Follow him to the well, and the person that was guarding the well when you entered the city, will be gone. Upon entering the well, you'll run into Kurt, and he'll tell you that he pushed the guard out of the way, but fell into the well in the process, as well as hurt his back. He asks you to finish the job by clearing out Team Rocket. The lower floor can only be accessed after the player has acquired both Surf and Strength. This section of the well enters from the ladder in the middle of the cave, on an island in an underground lake. 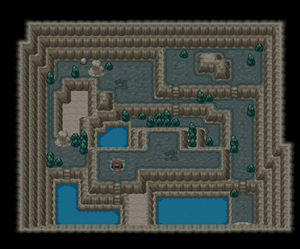 By surfing around this floor, there is a man on an island who will give players a King's Rock if they talk to him, while TM18 (Rain Dance) can be found on the ground. Kurt will make Poké Balls out of Apricorns after you've taken care of Team Rocket. If you bring him an Apricorn, he'll take it and have you come back the next day to pick up your new Poké Ball. The Poké Ball you get depends on the Apricorn you drop off. Apricorns can only be obtained from Apricorn trees located in special locations in Johto and Kanto. A tree holding White Apricorns can be found right outside Kurt's house. 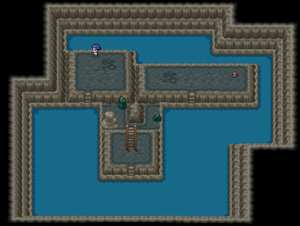 Once the Slowpoke have been saved and all is well again in Azalea Town, you can enter the Gym and take on its leader. A few Trainers are also inside the Gym. Nearly all of the people inside the Gym use Bug-type Pokémon, so take along Fire- or Flying-types. 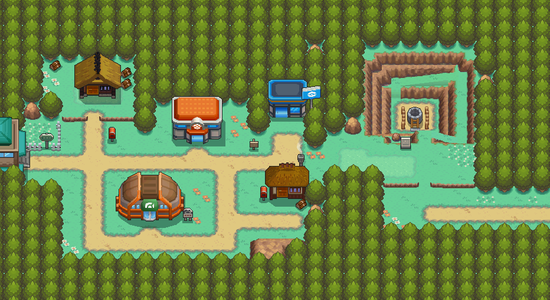 If you chose Cyndaquil as you starter, you'll be in great shape for this Gym. But other players will have to rely on Pokémon with Flying attacks, like Pidgey's Gust or Spearow and Hoothoot's Peck, or Pokémon with Rock attacks like Geodude and Onix's Rock Throw. Of course even your strongest Pokémon may not last long against Scyther's Fury Cutter. Fire, Flying, and Ghost Pokémon have partial resistance to this attack, but a Ghost is the best since it's completely resistant to Scyther's other attacks. Of course, a Gastly can't dish out much damage, so save some of your big guns, like Onix or Geodude, for this difficult final battle. After Leader Bugsy is defeated, he will give the player the Hive Badge, which allows you to use HM01 Cut outside of battle and control Pokémon from trades up to level 30, as well as TM89 (U-turn). Once you've clear out the Rockets, you can enter the Gym whenever you want. 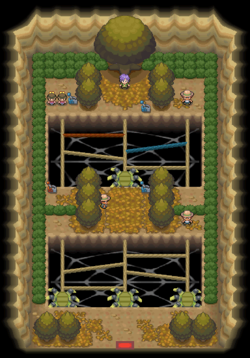 But when you try to leave Azalea Town to the west (before or after the Gym), your Rival will appear to challenge you. Make sure you heal and save first! Since his starter is usually his strongest Pokémon, it pays to train a strong Pokémon of the type it's most vulnerable to. A strong Electric-type could deal with many of your Rival's Pokémon nicely, especially if your rival has Croconaw. If your Pokémon are over Level 16 and are completely healthy, you should be able to outlast your Rival. This page was last edited on 11 May 2014, at 19:43. This page has been accessed 38,842 times.